Ooh Mummy! 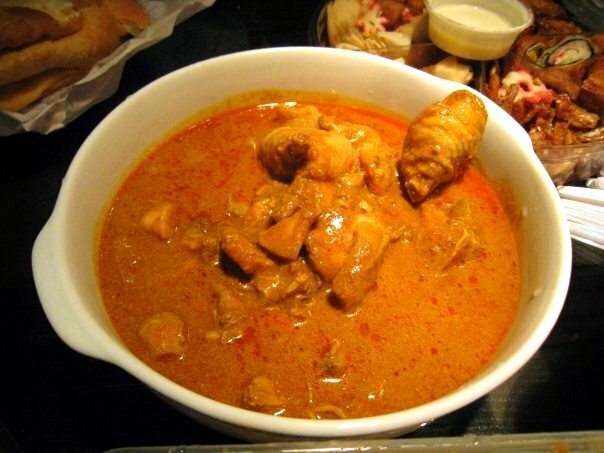 : A Singaporean Feast at Home-All in an evening's work. A Singaporean Feast at Home-All in an evening's work. 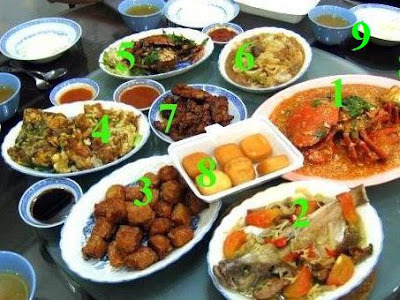 I miss home-cooked Singaporean food. While this list is by no means exhaustive, here's a mini show-case into what I had for dinner one evening with la familia when I was back. Seriously, I don't blame myself for gaining at least 3 kg (5 lb-ish) in my annual 3-week-long binge out sessions. food-wise we are locavores and use coconut milk, lemons/limes, dried shrimp/anchovies, spices etc native to SE Asia in our cooking. Makes sense right? 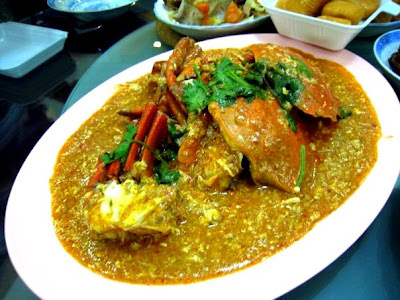 1) Chilli Crab-One of our most famous dishes, crabs are stir-fried in a tomato-chilli egg gravy. 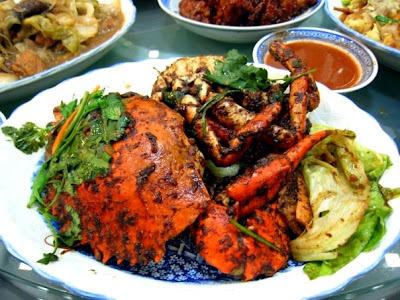 In Anthony Bourdain's No Reservations, Mr. B, professes his love for them chilli crabs. 2) Steamed Fish-My family eats fish EVERYday. 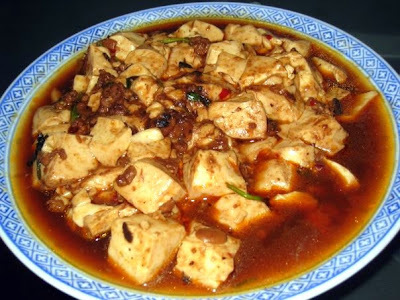 Usually steamed with Chinese mushrooms, ginger and tomatoes. So good and healthy. 4) Orh Luat-Oyster Omelettes fried with a special egg and gluten mixture. Very chewy and yummy! 6) Chap Chai-Stir fried Veggies of cabbage etc in a fermented Bean Sauce. Not to be confused with the Korean Jap Chae. 7) Home cooked-Chai Tao Kueh-Steamed radish cakes fried with sweet black sauce, pickled radish, spring onions and eggs. 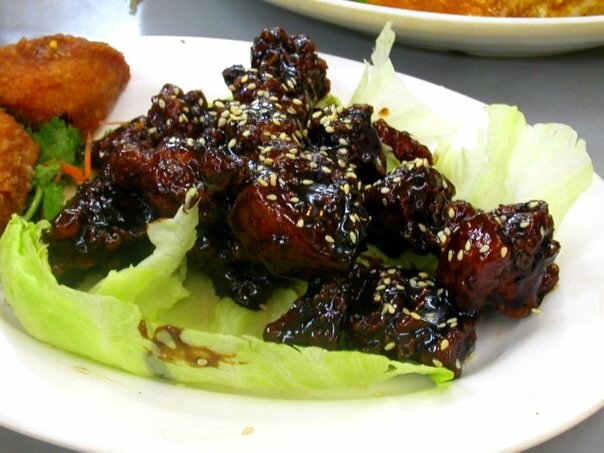 Coffee Pork Ribs-A new take on an old-favorite. Remember sweet and sour pork? Well, try coffee-flavored, caramelized sugar. Interesting and very very crispy and yummy. 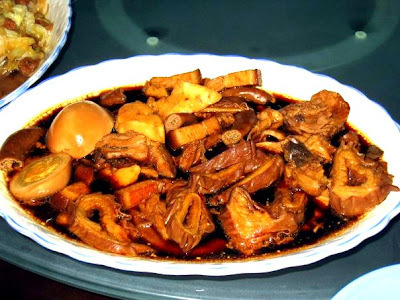 Kway Chap-Hard boiled eggs, pig innards (stomach, small and large intestines), tofu in a spicy cinnamon-anise-cummin broth. There is no metallic zing of the meat, it's not as disgusting as it sounds and the texture of the meat is firm and very very divine. 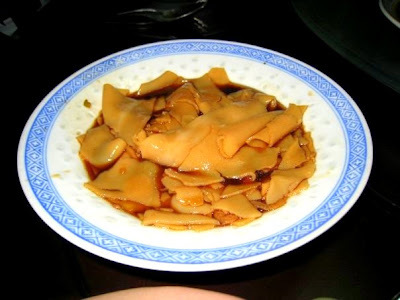 Kway Chap wide rice noodles. Mapo Tofu-This one's a staple in many other Chinese cuisines. My family's version is more watered-down and less starch-y and less less oily. I have a craving whenever I see these food pics too!